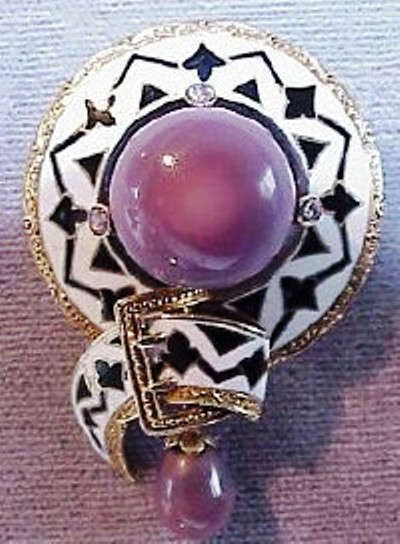 The name refers to a Victorian-style antique purple pearl brooch believed to have been created in the mid-Victorian period also known as the Grand Period, extending between 1860 and 1885, and discovered accidentally by Alan Golash, jeweler from Newport, Rhode Island, in the year 2000, when he together with his friend visited an antique shop, and was searching for anything interesting that could be restored and resold to a prospective customer, something he usually did to earn a living. On that particular day Alan had been extraordinarily lucky, and as he was browsing through the antique shop that was owned by two old ladies, his attention was drawn by an unusual piece of jewelry sitting in a basket of assorted antique pieces, that seemed to have escaped the attention of other prospective customers. In fact Alan was more interested in the 18k gold setting of the piece, than the gemstones used in the setting, which he presumed to be artificial stones used in costume jewelry. He purchased the piece for the quoted price $14 without any bargaining. Later Alan took the piece of jewelry to his workshop, and began to work on its restoration, cleaning and polishing the piece to bring out its original beauty. Alan could not believe his own eyes, at what eventually turned out after the cleaning. Being an experienced jeweler it did not take him much time to identify the true nature of the piece, something that had been hidden from the casual observer for over a century. It turned out that what he had actually purchased was an 18k-gold enameled "circle pin" set with two extremely rare quahog (pronounced KO-hog) pearls of the most desirable color (purple) and shapes, as well as three old rose-cut diamonds. Alan was well aware that quahog pearls of the most desirable color, purple, and symmetrical shapes such as round-button shape and tear-drop shape, possessed by the two pearls, commanded premium prices, which coupled with the antique value of the piece, was worth a fortune. When the news of the discovery first broke out, TV and Radio Stations in the United States and other parts of the world, camped out in Newport, Rhode Island, and sought interviews from Alan Golash, and it is reported that he did over 100 TV and Radio interviews, that was broadcast in 28 languages. Thus the quahog pearl brooch came under intense worldwide press coverage, and the press dubbed the brooch the "Golash Brooch," in recognition of its discoverer, Alan Golash. The name "Golash Quahog Pearl Brooch" further qualifies this name by also indicating the nature of the gemstone incorporated in the brooch. The name "Pearl of Venus" was given by Alan Golash to indicate the round-button shaped purple quahog pearl that forms the centerpiece of the brooch, which perhaps may be the largest gem-quality quahog pearl in the world with the most desirable characteristics. The name "Venus" can have two different connotations. It may refer to the "Goddess of Love" of Greek mythology, a pearl so perfect that it is suitable enough to be owned by the goddess of love, or be gifted to a lover as a symbol of eternal love. "Venus" is also the generic name of the bivalve clam that produces quahog pearls, the full scientific name being Venus mercenaria or Mercenaria mercenaria, the salt water clam found on the eastern shores of North America, from Northern Rhode Island to Southern Florida. Thus the name "Pearl of Venus" may also be interpreted to mean, the pearl that originated from Venus mercenaria. The circle pin brooch is made of 18k gold, enameled on the surface with white enamel carrying black decorative motifs, and leaving a border of gold. The brooch is made up of two sections. 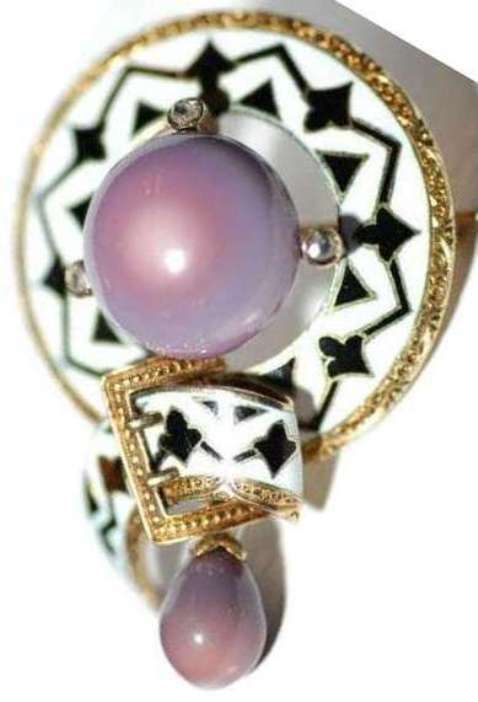 The upper section which is the main component of the brooch, is larger and circular in shape, whose centerpiece is the large purple colored quahog pearl, supposed to be the largest and finest quahog pearl on record, known as the "Pearl of Venus". The perfectly round dome-shaped exposed part of the pearl, is surrounded by a black enameled border. Three rose-cut diamonds are embedded on this black border, two of them placed on either side of the central rounded pearl in line with its horizontal diameter, and the third placed above in line with the vertical diameter. The black enamel decorative motif on a white enamel background, is a star-motif with eight rays, and eight spade-shaped motifs are placed one each in between two rays. 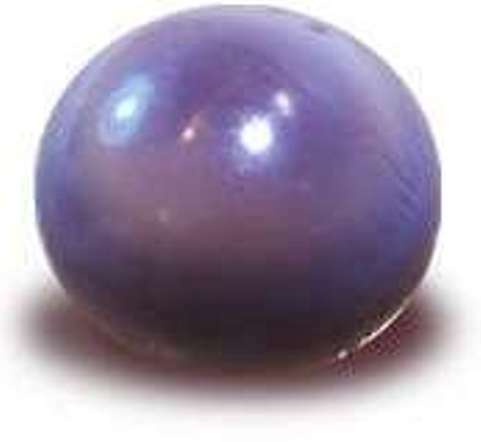 The color of the central round-button pearl is characterized as a medium-deep lilac color. Such lilac to purple shades of color are the rarest and most desirable colors in quahog pearls. The diameter of the pearl is 14mm. Generally most quahog pearls have an average size of 5-6 mm. Thus a 14 mm pearl is considered as exceptionally large for quahog pearls. The combination of exceptionally large size and extraordinary quality, makes this quahog pearl an extremely rare pearl indeed, worthy of being listed as a famous pearl. The pearl is button-shaped, and is set with its perfectly round and smooth surface exposed, and the almost flat lower surface at the bottom directly in contact with the setting. The round-button shape is a desired shape for quahog pearls, after the perfectly spherical shape, as it enables setting on a ring, pendant or brooch. The surface quality of the pearl also appears to be exceptional, without any blemishes, but the interesting thing about this non-nacreous pearl is the presence of a distinctive perfectly centered "eye." This distinctive "eye effect" a whitish area at the center of the pearl, enhances the value of the pearl. The presence of the "eye" does not in anyway diminish the overall all lilac color of the pearl. The luster of the Gholash pearl is also exceptional for a non-nacreous pearl, which usually has the "chalky" matte-like appearance. Some quahog pearls have a soft luster, produced by the reflection of light from its surface. Rarely quahog pearls can have a medium-luster resembling the sheen observed on the surface of fine porcelain, that produces a rare satiny glow. Such a medium-luster is considered exceptional for non-nacreous quahog pearls. The luster of the Golash pearl also known as the "Pearl of Venus" appears to fall under this rare category. Thus, the "Pearl of Venus" with its exceptionally large size of 14 mm, desirable medium-deep lilac color, round-button shape, flawless surface quality, medium-luster with a satiny glow, and the rare occurrence of a perfectly centered "eye" has made it the largest and finest quahog pearl in existence, ever recorded. The lower section of the brooch is made up of a spiral-shaped enameled band of 18k-gold, that is kept in place by a rectangular-shaped loop of 18k gold, attached to the upper section of the brooch. The enamel band has a black motif similar to the motif on the upper circular part of the brooch. A second quahog pearl smaller in size than the first pearl, and having a perfect teardrop shape is suspended from the lower part of the brooch as a pendant, by a bell cap and hook arrangement at the upper end of the pearl. This pearl has dimensions of 12 mm by 10 mm, the greatest length and width of the drop-shaped pearl. The weight of the smaller pearl is only 4 carats equivalent to 16 grains. Except for the shape and size of the pearl, all other characteristics such as color, surface quality and luster are almost similar to the round-button shaped "Pearl of Venus" the centerpiece of the upper part of the brooch. Is the "Pearl of Venus" a true pearl ? The "Pearl of Venus" is a quahog pearl produced by the saltwater clam Mercenaria mercenaria commonly found along the Atlantic coastline of North America. From a biological point of view all shelled mollusks are technically capable of producing pearls, such as oysters, mussels, clams, conches, scallops, Melo-melo shellfish etc. However, these pearls can be classified into two types :- Nacreous and Non-Nacreous. Nacreous pearls are pearls composed of a substance called nacre which is a complex organic-inorganic material. Conchiolin, which is the organic part of nacre, is a scleroprotein. The inorganic part is made up of hexagonal plates of aragonite or calcite, which are crystalline forms of calcium carbonate. The aragonite plates are arranged in parallel layers separated by the organic matrix, conchiolin. When light falls on the nacre, the tiny aragonite platelets that has a width comparable to the wave length of visible light, cause the scattering of light, producing the effect known as iridescence. From a gemological point of view only nacreous pearls that show the luster and iridescence caused by nacre are considered as "true pearls," and such pearls are produced only by saltwater oysters and freshwater muscles. Pearls produced by clams, conches, scallops, melo-melo shellfish etc. are non-nacreous pearls, and gemologically not considered to be "true pearls." The quahog pearls being produced by a clam is also not considered to be a "true pearl." In non-nacreous pearls too a nacre-like substance consisting of aragonite/calcite and conchiolin is produced, but the aragonite/calcite is deposited as needles, which does not scatter light as the short hexagonal platelets. Hence the nacre-like substance in non-nacreous pearls does not have the luster and iridescence of nacreous pearls. The luster of non-nacreous pearls is a low and subdued luster, with a sheen similar to that of porcelain, sometimes referred to as "porcellaneous." Some quahog pearls, conch pearls and melo-melo pearls showing the spectacular "flame structure" deserve to be reclassified as "true pearls"
Non-nacreous pearls are also sometimes disparagingly referred to as calcareous concretions, like kidney stones. However the use of this term may not be justified for at least some conch pearls, melo-melo pearls and quahog pearls, as they produce a flame-like shimmering effect known as a "flame structure" which is believed to be a form of "chatoyancy," whose spectacular effect sometimes surpasses the iridescent effect of some low grade nacreous pearls. This is one reason that has prompted some pearl experts to suggest that conch pearls, quahog pearls and other pearls that exhibit the "flame structure" be re-classified as "true pearls." The "chatoyant effect" of some non-nacreous pearls is caused by the fibrous nature of the nacre-like substance, the needle-like aragonite and calcite microcrystals that form bundles of microcrystalline fibers, whose alignment in a particular way causes an interaction of reflected light that produces the shimmer or the flame structure. This effect is similar to the "chatoyancy" (cat's-eye effect) produced by bundles of rutile fibers in gemstones like chrysoberyl, beryl, quartz, tourmaline etc. In this case however a luminous streak of reflected light known as the cat's-eye is produced, which is always perpendicular to the direction in which the fibers are aligned. When the needle like rutile fibers are aligned in two or three directions, in relation to the crystal structure, two or three intersecting bands or streaks of light are produced, and the "cahtoyancy is known as "asterism", as found in corundum such as star sapphires and star rubies. The cause of the "eye effect" in the "Pearl of Venus"
Gem quality quahog pearls are extremely rare, and the occurrence of quahog pearls of the desired color lilac to purple are rarer still. The probability of finding a lilac to purple pearl in a Quahog clam is estimated to be around 1 in 100.000. Out of this only around 1 in 20 are of gem quality. Thus the probability of finding a gem quality lilac to purple quahog pearl is 1/100,000 x 1/20 = 1/2,000,000; i.e. one in 2 million. In the case of the "Pearl of Venus" apart from its desirable color, medium-deep lilac, the exceptionally large size of 14 mm and the unique perfectly centered "eye" makes the pearl much rarer than one in 2 million. 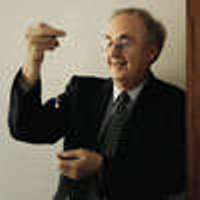 Thus the "Pearl of Venus" is an extremely rare pearl indeed! Antoinette Matlins of Woodstock, Vermont, author of "The Pearl Book. The Definitive Buying Guide," who had the privilege of examining the brooch in the year 2002, commented, "It keeps getting rarer and rarer and rarer. If you put all the factors together - its size, shape, color and eye effect, each adding increasing rarity - it is an extremely rare creation." Benjamin Zucker, president of the Precious Stones Co. in New York, author of "Gems and Jewels" and a jewelry adviser to Christie's and Sotheby's auction houses, said, "It's so rare, it's one of a kind. You cannot put a price on this pearl, because there is nothing to compare it to. It seems to me what Alan has found is exceedingly rare." Quahog pearls are produced by the species of saltwater clam known as Venus mercenaria (Mercenaria mercenaria), whose natural habitat is the north Atlantic coast, from Canada's Gulf of Saint Lawrence to Florida and extending to the Gulf of Mexico, and are particularly abundant between Cape Cod and New Jersey. Quahog pearls are produced in a range of colors such as white, pale lilac to purple, tan, brown and black, but the most desirable and valuable colors are the lilac to purple shades. According to antique jeweler Golash, quahog clams that produce lilac to purple quahog pearls, are found mainly in region of New England, on the Atlantic coastline of the northeastern states of Maine, New Hampshire, Massachusetts, Rhode Island and Connecticut. Quahog pearls found elsewhere such as New Jersey are not purple. Thus the purple quahog pearls on the brooch, the "Pearl of Venus" and the smaller tear-drop shaped pearl, most probably originated in the Atlantic coastline of one of the states in the New England region. The Rhode Island State Government has designated the Mercenaria mercenaria- Hard Clam, shell as the State Shell of Rhode Island. The origin of name "quahog"
The name "quahog" has its origin from the Algonquin Indian name for this particular clam "Poquauhock" found predominantly along the Atlantic coast of North America. The quahog pearls were valued for centuries by the native Indian tribes who lived along the Atlantic coast of New England. The pearls as well as the shells of the clam cut into beads, were used for self adornment and "wampam" an early form of currency. The scientific name for the quahog clam is Venus mercenaria or Mercenaria mercenaria, derived from the use of its shell for money, as "mercenari" in Latin means "hired for wages." The Class Bivalvia includes oysters, salt and freshwater mussels, clams, scallops, shipworms, coquinas, cockles, zebra mussels etc. The main characteristics of this class of mollusks are :- Laterally compressed body enclosed in a bivalve shell, with the two valves hinged dorsally; the presence of a large foot adapted for digging; the presence of a crystalline style, but absence of a radula; the mantle cavity is lateral; the gills are large and function in respiration and filter-feeding; a reduced head with no special sense organs; the nervous system is not cephalized. Most bivalves are metabranchs, whose main characteristics are the gills being adapted for filter-feeding, and water entering the mantle cavity posteriorly. The main characteristics of the Order Veneroida are the shell being equivalve, as the valves are identical in size and shape; and the shells being without a nacreous layer. The natural range of the quahog clam Mercenaria mercenaria is the east coast of North America from the Gulf of St. Lawrence in Canada to the Gulf of Mexico. Within this natural range the abundance of the clams can vary depending on the availability of optimal environmental conditions such as salinity and temperature. They are found in the bays, coastal lagoons and estuaries. The Chesapeake Bay, the largest estuary in the United States surrounded by Maryland and Virginia, is one such habitat that provides the optimal conditions of salinity and temperature for the survival and multiplication of the clam. Clams grow within a temperature range of 10-30 °C, but optimal growth occurs between 18-25 °C. They are also found abundantly in Cape Cod bay in eastern Massachusetts, extending downwards up to New Jersey. 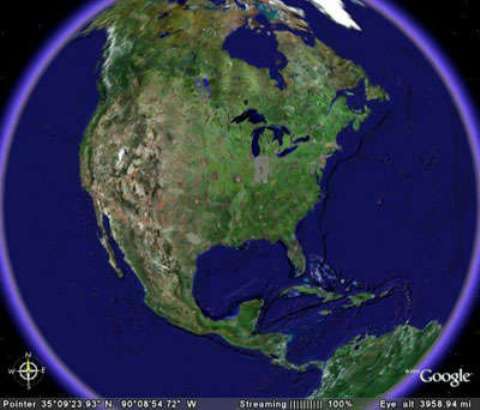 The geographic range of Mercenaria mercenaria, has now been extended by artificial means, beyond its natural range from the east coast of North America, to Humboldt Bay in California in the west coast, and other areas of the world such as Puerto Rico in the Caribbean, England, France, Holland, and Belgium in Europe, Taiwan and China in Asia, due mainly to the popularity of the clam as a delicacy. However, efforts to establish self-sustaining populations, on the south coast of France and around Sicily, in the Mediterranean Sea have met with little success, possibly due to high saline conditions. Mercenaria mercenaria also known as hard clam, has a thick chalky shell, made up of two similar valves, that fit together tightly to enclose and protect the soft parts of the animal. The shell which is sub-ovate or triangular in shape, has a dirty white, pale brown, grayish-brown or dull-gray color externally, while the interior is white with distinct violet areas near the umbo. The two valves are joined dorsally at the flexible hinge, and are free to separate from each other along the ventral margin. The valves are strongly convex and bear a conspicuously raised protuberance known as the umbo, on the dorsal surface near the hinge. Concentric growth ridges are centered around the umbo, which are widely spaced near the umbo, and closely spaced near the margins of the shell. The shell is composed of proteins (conchiolin) and calcium carbonate (aragonite and calcite). The opening and closing of the valves of the shell is a function of a pair of adductor muscles and a pair of ligaments, located on each side of the shell. When the adductor muscles relax and the ligaments contract the valves of the clam open; and when the adductor muscles contract and the ligaments relax, the valves close. The presence of three pairs of strong teeth on the hinge on the dorsal side, ensures the proper alignment between the valves each time the shell closes. The presence of fine teeth known as denticles on the ventral margin of the valves prevents shear or sideways slipping when the valves are pulled tightly together by the powerful adductor muscles. Like all bivalve mollusks the quahog clam also has a large muscular foot adapted for burrowing into the sand, located at the front end, that can be extruded between the valves. Hard clams burrow just below the surface to a depth of about 15 cm. The head is rudimentary, with a mouth but without eyes and antennae. The visceral mass contains the gut, the heart, gonads and kidney. The bivalve body is enclosed on the right and left by thin double layered body wall, known as the right and left mantle skirts. The mantle skirt is a thin sheet of tissue free at the ventral edge of the clam, but connected with the body and the shell dorsally. The large space between the right and left mantle skirts, is the mantle cavity in which the body or the visceral mass lies. The mantle cavity is continuous with the outer marine environment, and is filled with sea water. The mantle cavity is divided by the right and left gills into two chambers of unequal size - a larger ventral chamber below the gills, known as the branchial chamber or the inhalant chamber, and a much smaller dorsal chamber above the gills known as the supra-branchial chamber or exhalant chamber. Posteriorly, the right and left mantle skirts coalesce with each other across the midline to form two short tubular siphons. The siphons are darkly pigmented and have short sensory tentacles surrounding its outer aperture. The lower or ventral siphon is the inhalant siphon and the upper or dorsal siphon is the exhalant siphon. In its natural habitat, Mercenaria normally lies shallowly embedded in sediment with only the tips of the short siphons exposed, above the surface of the sediment. Water containing oxygen and food particles enters through the incurrent siphon, impelled by the beating of millions of cilia (hairlike structures) on the gills. This water bathes the gills, where respiratory exchange of gases take place, and water containing waste matter, passes through tiny openings in the gills known as ostia, to enter the exhalant chamber from where it exits via the exhalent siphon. Gill cilia strain food, such as tiny plankton, from the incurrent water and transport it entangled in mucus along a groove above the foot to a pair of muscular structures called the palps, which forces the food into the mouth, a process known as filter feeding. In Mercenaria the sexes are separate. Each mature clam has two gonads, either ovaries or testes, which occupy most of the visceral mass. 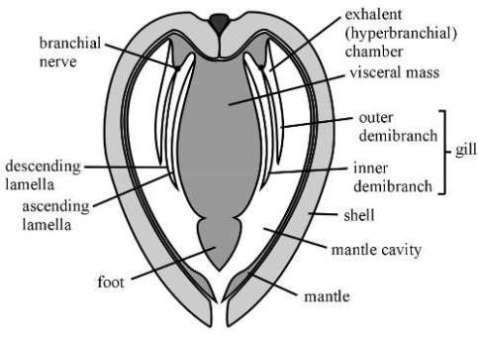 It is difficult to distinguish between male and female clams externally, or internally by examining the gonads. Only by examining the gonadal tissue under a microscope can one differentiate between a male and a female. Spawning takes place at a temperature range of 20-25 °C. At first the male clam discharges sperms into the water, along with the excurrent water leaving through the exhalent siphon. This stimulates the females to release their eggs also along the excurrent water. Fertilization is a chance external phenomenon taking place in the water. Thus to compensate for wastage and to increase the chances of fertilization large numbers of sperms and eggs are produced, with large numbers of clams spawning at the same time. A mature female clam has been estimated to spawn 1 to 5 million eggs per spawning event, producing up to 40 million or more eggs per year. Likewise sperms are also produced in enormous quantities. After fertilization, during the first 12-14 hours the fertilized eggs become trocophore larvae, which are tiny and cylindrical with cilia and swim about feeding on diatoms. By the beginning of the second day, the trocophore larvae has transformed into a veliger larvae, with tiny lobes that may be used as paddles for swimming. In the next 6-10 days, the body organs, foot and shell begin to develop. The lobes are shed and the foot develops byssal threads, that fix the larvae to rocks, sea weeds or other sedimentary deposits on the floor of the ocean. After the secretion of the shell is complete, calcification takes place and the byssal threads are detached, producing adult clams, that burrows into the surface. The larvae during their free floating period can be dispersed by currents, and preyed upon by other animals like crabs. Thus only about 10% of all veliger larvae reach adulthood. At very low temperatures both spawning as well as other growth activities are drastically reduced. The natural life span of Mercenaria in not known for certain, because most of the clams are harvested for food. However, counts of growth rings indicate that the hard clam, in the absence of predation or commercial exploitation, may live as long as 40 years. The general observation that has been made is that the growth of the clam almost ceases after the age of 15 years, with annual growth slowing down to about 1 mm per year. Among the important factors that affect the growth and distribution of Mercenaria mercenaria are 1) water temperature 2) salinity 3) Oxygen 4) pH 5) food availability 6) degree of crowding. 1) Water temperature :- Water temperature is the most important factor that sets the limits of growth of the hard clam. The optimal growth temperature of hard clams has been determined to be 20 °C, with no growth taking place above 31 °C or below 9 °C. At 4 °C Mercenaria enters hibernation. Maximum growth of larvae takes place between 22.5 - 36.5 °C with a minimum temperature requirement of at least 12.5 °C. Thus in the northern areas of the geographic range in the east coast of the United States, growth of hard clams take place only during the summer months when water temperature reaches 20 °C, the optimal temperature for their growth. During winter growth ceases completely when temperature fall below 5-6 °C. In the southern areas of the range growth tends to be more continuous. However, growth is rapid during spring and autumn (fall), tends to slow down during the winter months, and is the slowest during the hot summer months. In Florida the growth rates of Mercenaria is 3 times greater than in the northern waters. 2) Salinity - Salinity also affects the survival and distribution of hard clams, which are particularly vulnerable to adverse environmental conditions caused by the drop in salinity. Older hard clams show greater tolerance towards decrease in salinity. The combination of low salinity and high temperature can be drastic to the development and survival of the hard clams. 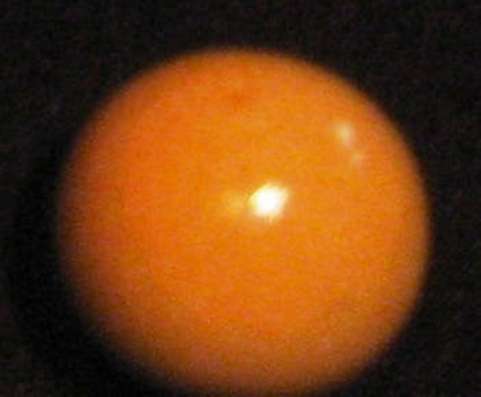 Normal egg development takes place within the salinity range of 20 to 32.5 ppt. It has been found that when the salinity exceeds 35 ppt, only 1% of the eggs develop to the larval stage, and at salinities below 17.5 ppt, none of the eggs develop at all. Maximum growth of larvae takes place at salinities between 21-30 ppt. When salinity decreases, growth of larvae also decrease, and ceases below 15 ppt, the larval mortality also increasing. Adult clams are able to withstand low salinity as low as 10 ppt for up to 4-5 weeks, by closing their valves. 3) Oxygen Concentration - For normal development of embryos oxygen concentration in the water should be at least 0.5 mg/L (milligram per liter). When concentration drops to 0.2 mg/L, 100% mortality of the embryos occurred. When the concentration was 0.34 mg/L development of the embryo proceeded only up to the trochophore stage, with no shell formation. The growth of larvae was optimal above 4.2 mg/L, and poor below 2.4 mg/L. 4) pH - The pH optimum for the growth of larvae is between 7 and 8.75, i.e. neutral to slightly alkaline. However, adult hard clams can tolerate a much broader pH range. 5) Availability of food - The main food of hard clams are single-celled algae and diatoms, that are taken in by the inhalent siphon, filtered by cilia over the gills and directed towards the mouth, along ciliary tracts. The availability of these single-celled planktonic algae in the aquatic environment also influence the growth of the clams. It has been found that the density of hard clams on eel grass beds in North Carolina, is 5 times more than the density in nearby sand flats. The size of the hard clams growing on the eel grass beds were also slightly greater than those from the sand flats. Both the increase in numbers and the size has been directly correlated with the availability of more food in the eel grass beds for juvenile clams, said to be caused by hydrodynamic baffling by the sea grass, which simply means, reduction in underwater currents around the sea grass, that enhances the deposition of fine sediments and suspended materials around the blades of sea grass, that provides a rich food source for the clams. 6) Degree of crowding - This is also associated with the density of occurrence of clams in natural or farm conditions. Greater the density of occurrence of the clams slower is their growth rate. Hard clams reared at high densities (>360 per square foot) were found to take longer to reach the same size as those reared under less crowded (approximately 30 per sq. ft.) conditions. This is obviously related to the amount of food available for the clams under both conditions. Mercenaria is commercially more important as a source of food, than as a source of pearls. 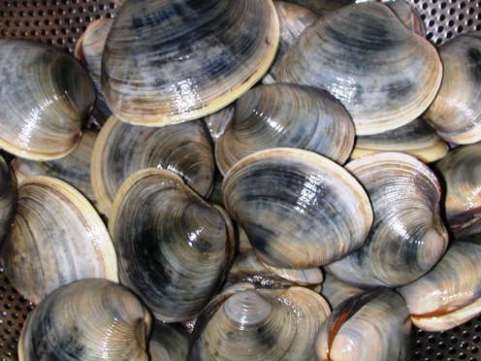 Hard clam meat is a popular delicacy and highly valued source of food, that many eastern coastal states in United States invested heavily in the aquaculture of hard clams to meet the increase in demand. The pioneers of the hard clam aquaculture industry were Massachusetts, New Jersey and North Carolina in the late 1970s. 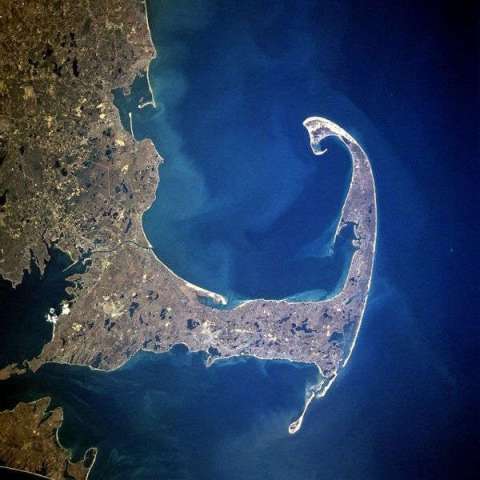 By the late 1980s hard clam aquaculture had spread to all the eastern coastal states from Massachusetts to Florida, but the major producers were Massachusetts, Connecticut, New York, New Jersey, Virginia, South Carolina and Florida. Florida and Virginia have emerged as the top most producers in recent years. In the State of Florida, the commercial catch of wild harvested hard clams Mercenaria mercenaria, between the year 1987 to 2001 was 13.5 million pounds, with a dollar value of over $98.9 million, an average of $6.59 million per year. The popularity of the clam lead to its introduction into waters that were not originally its natural home, in the west coast of the United States and countries in the Caribbean, Europe and Asia. An interesting fact about Mercenaria mercenaria as a source of food is that during its development it is more valuable when it is within a certain range of size, 2 - 4 inches (5 - 10 cm), beyond which the value decreases. The peak period of their commercial marketability is approximately between 4 and 8 years of age, when the clams measure between 2 - 4 inches (5 - 10 cm). When the clams are between 2.0 and 2.9 inches (5.0 - 7.4 cm) they are known as "littleneck" and when the size is between 3.0 - 4.0 inches (7.6 - 10.0 cm) they are referred to as "cherrystones." Those clams that grow above 4 inches are known as "chowders" which are not as valuable as the previous two categories. Possible period in which the Golash Quahog Pearl Brooch was designed ? Nothing is known about the country of origin of the Golash Quahog pearl brooch, or where the brooch was designed. However, a study of the design and style of the brooch, and the materials used in its execution might provide some indication as to the period of its origin. Based on this information most jewelry experts believe that the Golash pearl brooch appear to be of Victorian origin, belonging to the mid-Victorian or Grand period, extending from 1860 to 1885. Circle brooches were a common design during the mid-Victorian period. Materials used for these brooches included gold, enameling, cabochon-cut deep-red garnets, pearls, and rose-cut diamonds. Margaret Flowers' book "Victorian Jewelry" gives black and white photographs of several circle brooches of the Mid-Victorian period. One of the circle brooches designed in 1865 is mounted with a large cabochon-cut deep-red garnet in the center, surrounded by a layer of pearls and rose-cut diamonds. A pendant made of pearls hangs from the brooch, with two loops of pearls on either side. Another circle brooch designed by Giuliano between 1865 and 1870, is made of enameled gold, with a cabochon-cut deep-red garnet in the center, surrounded by rows of rose-cut diamonds, and eight pearls placed symmetrically along the vertical and horizontal diameter of the circle. A drop-shaped pendant hangs from below the brooch, whose centerpiece is a drop-shaped deep-red garnet. More circle brooches designed by Howell and James and displayed at the 1862 exhibition, are given on page 180. A photograph on page 181 also shows several circle brooches designed by Richard Green, and displayed at the 1862 exhibition. One of these brooches show a double row of pearls, surrounding a cabochon-cut gemstone in the center. The Gholash Quahog pearl brooch, is essentially based on the same design as the above brooches of the mid-Victorian period. The brooch is made of enameled gold, a common material used for brooches during this period. The gemstone used as the centerpiece of the brooch is the large purple colored quahog pearl, known as the "Pearl of Venus." The black enamel design on a white enamel background, also depicts a trend that was common during the mid-Victorian period, a period of mourning for the Queen after the death of her beloved husband Prince Albert in 1861. During the first year of full mourning, black clothing and black jewelry were worn by the mourners. Black enameling of jewelry became popular during this period. Dark stones such as onyx, jet and vulcanite, were used in mourning jewelry. After the first year of mourning, half-mourning colors such as gray, mauve and purple clothing were used. Then purple amethysts, deep-red garnets and white pearls were also used in the mourning jewelry. The deep-red garnets used in the brooches described above, were a part of the mourning jewelry of this period. In the Gholash pearl brooch instead of a purple amethyst, a purple quahog pearl is used, the purple color being another feature of the half-mourning period. 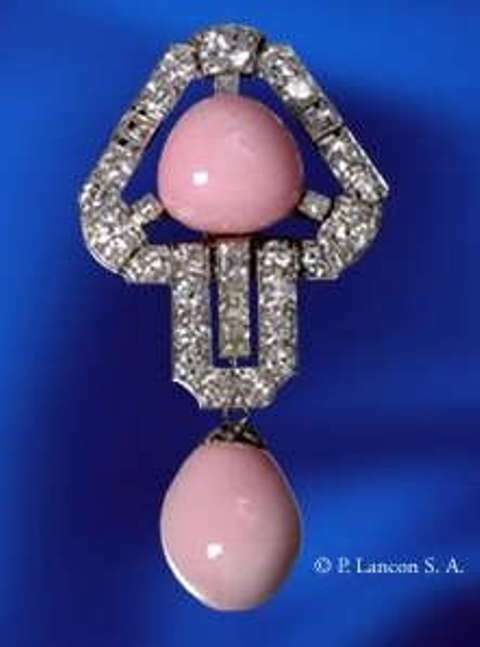 Another feature in the Gholash pearl brooch, similar to the Victorian brooches is the incorporation of a pendant to the brooch, whose centerpiece is another drop-shaped quahog pearl. 1) The shape of the brooch being a circle, a common shape of brooches during this period. 2) The use of enameled gold for the brooch. 3) The use of a black enamel design on a white enamel background. 4) The use of a purple quahog pearl as the centerpiece of the brooch, purple being an accepted color during the half-mourning period. 5) The incorporation of a short pendant to the brooch, whose centerpiece is another purple drop-shaped quahog pearl. The use of purple color for the pendant again conforms to the accepted use of colors in jewelry during this period. Thus the Gholash pearl brooch most probably originated in the mid-Victorian period from 1860 to 1885, nearly 150 years ago. Golash had been seeking the advice of Benjamin Zucker, the president of Precious Stones Co. in New York, a renowned gemexpert, merchant and author, to obtain a reasonable price for his rare pearl brooch, by putting it up for sale at a reputed auction house like Christie's or Sotheby's. Zucker who was impressed by the pearl brooch, and described the quahog pearls in it as exceedingly rare and difficult to be valued, as there was nothing to compare it with, advised Golash to promote the pearl brooch by exhibiting it in natural history museums and exhibitions conducted by these museums, as well as in international gem and jewelry shows. He also advised Golash to find out everything about the provenance of the brooch, including its possible period of origin by consulting jewelry experts and historians, as a major part of the value of famous and historical pieces of gems and jewelry, was their provenance. Was the Golash Quahog Pearl Brooch designed and crafted in Rhode Island, the hub of the jewelry industry in the United States, in the mid 19th-century ? Accordingly, Golash first met the owners of the antique shop at Newport, Rhode Island, where the pearl brooch was purchased. That was in the year 2002, two years after he purchased the pearl brooch. The antique shop was no more, and the two elderly ladies had since retired to Florida. He showed a picture of the pearl brooch to the old women, and asked them if they could provide more information on the history of the brooch. But unfortunately, the women said they could not remember it, which obviously meant that they could not even remember selling the piece to him. Drawing a blank in his efforts to trace its history, Golash consulted jewelry historians, who placed the probable origin of the pearl brooch to the Victorian period, somewhere between 1850 and 1875. The history of jewelry manufacturing in the United States dates back to the period immediately after the revolution of 1776. The first jewelry shop where jewelry manufactured in the United States was sold, was opened in Providence, Rhode Island in August 1784, by a jeweler named Seril Dodge, who manufactured watches, clocks, and gold and silver jewelry. Dodge's business prospered as Providence became the center of the maritime trade, and soon several other jewelry shops were also opened. In 1794, as Seril Dodge was about to retire from business, his nephew Nehemiah Dodge opened his own jewelry shop for the manufacture of 18k gold jewelry. However, Nehemiah Dodge soon developed a technique for plating base metal like copper with gold. He became the first manufacturer of roll plated gold, which was used for turning out cheaper jewelry for the less wealthy. This was the beginning of the costume jewelry industry in the United States. On the foundation laid by the Dodge family, the jewelry industry of Providence grew rapidly in the mid 19th-century, and soon expanded to other regions of New England. From 27 jewelry firms in 1830, employing 280 workers, the jewelry industry of Providence, Rhode Island, expanded to 150 companies, employing 2,700 workers by 1875, and by 1880, Rhode Island was the leading state in the manufacture of jewelry in the United States, accounting for more than one-quarter of the entire national jewelry production. By the year 1890, the number of jewelry firms in Providence, had grown to 200, employing 7,000 workers. 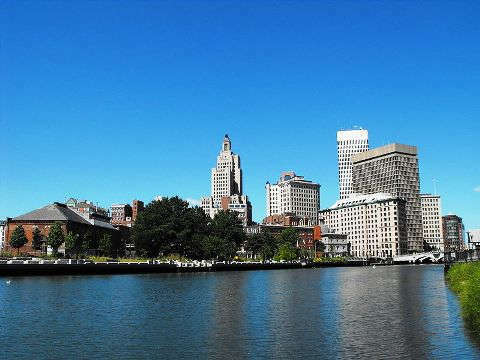 Thus Rhode Island became the hub of the jewelry industry in the United states, at the turn of the 20th-century, introducing several technological innovations to the industry, such as Levi Burdon's invention of seamless filled wire, which stimulated the chain-making industry, the introduction of electroplating, and the mechanization of the industry. 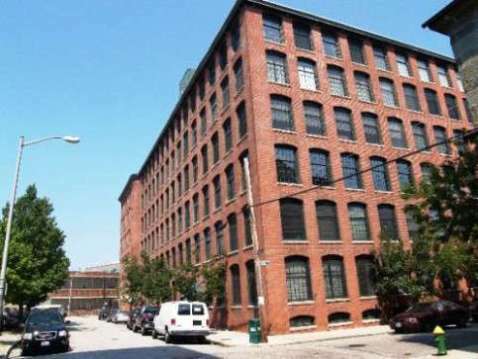 In keeping with the growth of the industry in Providence in the second half of the 19th-century, was the development of a jewelry district in the city, with large multi-storied buildings such as the Bowen Building and the Fitzgerald Building. In keeping with Bejamin Zucker's advice, to promote the rare pearl brooch, Golash exhibited the brooch at the Tucson International Gem and Mineral Show in February 2005. The Tucson Gem and Mineral Show is the largest international show of its kind in the world, that usually attracts around 50,000 visitors, including 4,000 dealers, from all over the world, and bringing a revenue of $75 million to the city. The purple pearl brooch attracted great attention at the show, due to its extreme rarity. Antoinette Matlins, the author of the "Pearl Book : The Definitive Buying Guide" also attended the show, and according to her the jewelry industry's three largest magazines were writing articles about the rare Purple Pearl. The Smithsonian Institution was said to be considering considering the possibility of including it in their "Natural Pearls" exhibition, and the American Museum of Natural History was also reportedly interested in exhibiting it. According to Matlins, Golash's intention was to loan the pearl brooch to the American Museum of Natural History to be exhibited in their worldwide traveling exhibition, "Pearls : A Natural History," which was first held in New York in October 2001, and was expected to tour the world until 2007. Golash's rare quahog pearl brooch was exhibited for the first time at the American Museum of Natural History's worldwide traveling exhibition, "Pearls : A Natural History" held at the National Science Museum, Tokyo, between October 1, 2005 and January 15, 2006. Later it was due to be exhibited at the Australian Museum in Sydney, from April 8, 2006 to August 6, 2006, and then in Abu Dhabi, UAE from December 10, 2006 to January 27, 2007, and finally at the Musee National d'Histoire Naturelle, Paris, from October 24, 2007 to March 10, 2008. After the worldwide promotion of the brooch, Golash was intending to put it up for auction in Hong Kong under the auspices of one of the renowned auction houses, such as Christie's or Sotheby's. The decision for picking Hong Kong as the venue for auctioning the pearl, was because the Far East was considered as one of the primary markets for pearls. The outcome of the auction of the Golash quahog pearl brooch, if and when Alan Golash decided to put it up for sale, was eagerly awaited by pearl markets around the world, and particularly pearl enthusiasts, collectors and prospectors for quahog pearls in the east coast of the United States. Several people living in states along the east coast of the United States, had made accidental discoveries of good quality quahog pearls, either when eating processed quahog clams in restaurants and hotels, or while enjoying a dish of quahog clams prepared at home. Quahog clams are a popular delicacy in most of these states. Quahog pearls are extremely rare, that historical precedence in their pricing is virtually non-existent. Thus the auction results of the Golash quahog pearl brooch is eagerly awaited, as it could set the benchmark for the valuation of quahog pearls in the future. The projected value of the Golash Quahog Pearl Brooch ? According to Alan Golash, pearl experts, dealers and enthusiasts had quoted a value ranging from $250,000 to $ 1 million for his rare quahog pearl brooch. Antoinette Matlins, the renowned pearl expert who was at the 2005 Tucson Gem and Mineral Show, said " No one knows what its value is. Everyone at the Tucson show agreed it wasn't unreasonable to expect $250,000 without any promotion to make the world aware of it. And these are gemologists who are notoriously conservative." Thus $250,000 can be taken as the most conservative estimate for the value of the rare quahog pearl brooch. However, in a situation like this where there is no precedence for pricing and no one exactly knows the pearl's actual value, the skeptics also have their say, and most of them seem to think that the projected value for the pearl is unreasonably high in comparison to the values of natural and cultured pearls of similar size, 14 mm. They seem to think, the shape of the pearl being button depreciates its value, which they believe is not as high as perfectly spherical pearls. 8) The Purple Pearl - Robert Genis. Gemstone Forecaster, Vol 23, No. 2, Summer 2005. 10) Pearls : A Natural History - International Art Treasures Web Magazine, August 2004.